The dogteam is not only for competition. You can get a dogsledge experience with us, you can hire us for transport of equipment, or you can come to the kennel for a variety of activities, both winther and summer. By contacting us you can experience dogsledding and the nature in Lyngen and the Lyngen Alps in a new way. You are welcome to visit the kennel here at Karnes. This is a shorter trip, but a fun and the most popular experience. Drive your own team of Huskies in the woods and on the fields around the farm. You will get a personal experience with the dogs and can pet and play with them all toghether in the open area of the dogyard before and after the dogsledding. Afterwards you will get a cup of coffee or tea by a campfire on the beach and get answer’s to your questions about almost anything. I am local, and any emplyee that may be here that day will also have a lot of knowledge about both the dogs and most other things about this area. Without snow you can still come here and play with the dogs in the dogyard. Maybe you have a fear of dogs and whant to get rid of that fear? I can make it dissapear in less than 30 minutes 🙂 Since we can have more people on this option you might not be alone, but it will never be large groups. You will spend 3-3,5 hours here. For 2 – 10 people. The 14 alaskan huskies in the team are friendly, calm, and socialised. They are happy to give you a sledride you never forget. This is in other words perfect for couples, or two persons travelling together. The Full-Day trip is great from mid February to mid april. In December and January it is often poor snow conditions, cold and not much daylight. By dogsledging with Team Lyngen, you are guaranteed to enjoy the trip alone with the guide and the huskies. In contrast to buying a trip from the major players where you risk to run in a queue with many others. Since I do the job myself, and are born and raised here, I can guarantee a local guide with good knowledge about the Lyngen Alps and this dogsport. My English is good. The way we do it is that we go out with two or three sleds. I will run the first one, and you follow on each your sled behind. If you don’t feel comfortable with driving yourself, one of you can sit on my sledge. We will make a stop out there to make a fire and some coffee or tea. If it is in the dark, we will hopefully see some good northern lights out in the wild. We will be out with the dogs for at least 4-5 hours, and depending on area and snow conditions go for up to 25 km. You have the chance to take pictures and get answers to anything you wonder about. You have to be reasonable fit, used to outdoor activities and in general be in good health since this trip is demanding. The price for this trip is NOK 1800 per person. We can transport equipment and do other support for downhill skiers, cameracrew and campers. The load capasity for the sled is app. 100 kg. It is possible for 2-3 persons to put the backpacks on the sledge and be towed. On a good trail you get 15 km in one hour. Doing this the load on the sledge can not exceed much more than 50 kg. You can get good answers about most things about this sport, the dogs and other things. If it is a cold summer day you can se how we train before we get snow. You can also hire me as a guide for hiking in the Lyngen Alps in the summertime. If you need a pathfinder to get somewhere or you want to learn more about this area while hiking. Contact me and we make a plan. 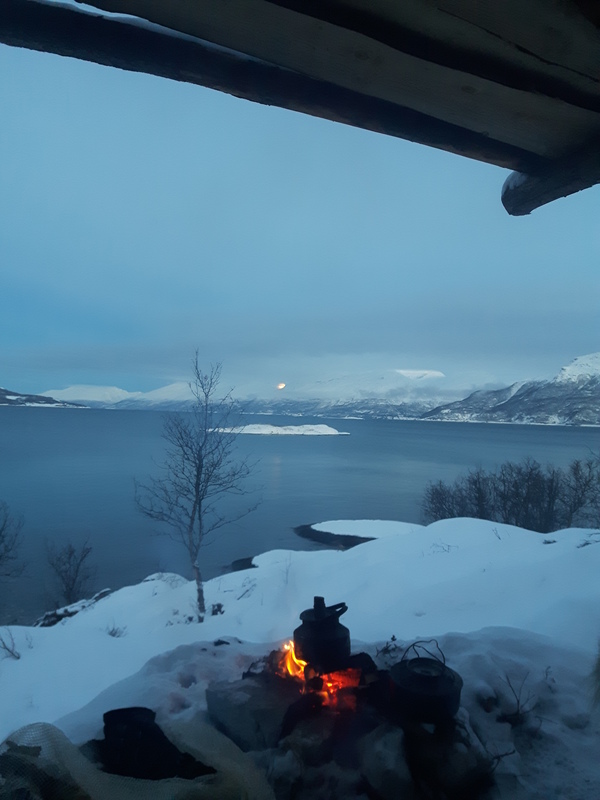 If you spend time here in Lyngen, and stay in a place where we can start from, or have a car avilable so you can transport yourself the trip will cost 1800 NOK per person. I do not offer transport from e.g Tromsø. The experience is physical demanding. If you stay somewhere they offer transport for you to get here, they will normally charge you a bit for that. If you come to the farm here at Karnes to dogsled, you will get a shorter trip. You will drive your own team of Huskies on the trail on and around the farm. it will cost NOK 900 pr person. Kids under 14 free when followed by adults. This option is less physical demanding, and you have the possibility of just sit on a guide’s sled instead of driving your own team. For transportation of equipment, contact me and we will agree a price from how, where and how far. As an example we have transported uquipment for groups of skiiers who had a basecamp in the valleys in the Lyngen Alps. We have transported heavy equipment for filmteams in areas where snowmobiles are not allowed to go. If it is much equipment we can do several lifts. Another option is to film the dogs in action, or from the sledge. For a visit at the kennel, to pet and play with the dogs: NOK 400 per person. Under 14 years free when followed by adults. When we buy something, we like to feel the price is fair compared to what is delivered. We want you to have that feeling after you met us! Having done the trip with Tommy I can really recommend him and his dogs. We went to visit Tommy and his dogs in February 2014. The dogs are very friendly en well behaved. After inquiring I was able to go with Tommy on a trip the same day, and I loved it! The description above is exactly what you can expect, 1 on 1 with the guide (Tommy) who has excellent knowledge of the area. We went for a evening trip with two sleds with 6 dogs each. I did not want to be in a mass tourist trip (trap) with a train of sleds so this was the perfect solution and cheaper too! Tommy, thanks for your effort in providing a Great experience! We were very happy to participate with you on this exceptional trail with sled dogs in a beautiful landscape in nature. You are someone with a good knowledge of the field and very friendly. I also admire dogs that feel good in Norwegian nature. I highly recommend this tour ……! Glad to meet you Tommy. Michel and Cédric, of Belgium.